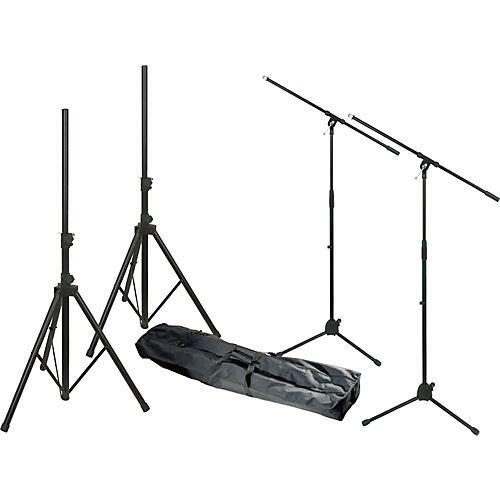 The Musician's Gear MG280 package comes with all the PA system stands you need for your rig. You get 2 Musician's Gear MS-220 tripod mic stands with fixed booms, 2 Musician's Gear All-Steel Tripod Speaker Stands and a Musician's Gear speaker stand bag to carry them in. MS-220 tripod microphone stands feature a thread adapter and tubular legs, and have an adjustable height from floor to top thread of 35" to 61-7/8". The 30-1/4" fixed booms are not adjustable. This handy Musicians Gear speaker stand bag is made of 600-denier nylon construction and holds 2 speaker stands. It also has webbed handles and a carrying strap for easier hauling, and durable, heavy-duty zippers.